whew, somehow this week is dragggggging by. i can't believe it's only Wednesday! tomorrow i have to get up bright and early to go to a seminar about our upcoming big move... from the east coast to the west coast. i'm SO excited! one beach to another, doesn't get better than that. my husband is a Naval Officer and is going to attend a naval postgraduate school for his masters degree. the climate is supposed to in the sixties (F) all year... and that is my fave temperature. so ready to leave all this blistering hotness and humidity! today is our first look at Essie polishes... they are phenomenal! even though it's a traditional brush, the polish is a dream to work with. i used Trophy Wife, a pearly turquoise. i had to buy it because my husband calls me his trophy wife... nauseatingly cute, right? it was opaque in two coats and i didn't have trouble with bubbling... even on my ring finger, which is my Achilles heel for some reason. i completed the look with Essie Carnival. i hemmed and hawed over whether or not to purchase this one, i do own several holographic glitters. 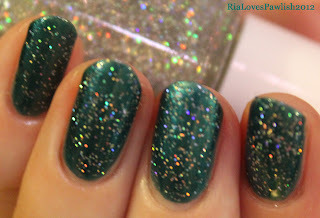 this one is brilliant in its simplicity... it is chock full of tiny round glitter. i'll let the swatches speak for themselves! two coat TW topped with one coat Seche Vite. one coat Carnival topped with another coat of Seche Vite.